Balanced hybrid cannabis strain perfect for recreational and medicinal users. Dark Angel cannabis seeds are an equal 50/50 blend of both Sativa and Indica genetics, combined to create a perfectly balanced hybrid strain. Comprising of two, highly prized strains, Cheese and Jack Herer, Dark Angel seeds are great for both medical and recreational users, offering a dreamy, euphoric high, while reducing pain, stress and anxiety. Perfect for relaxing and unwinding at the end of the day. Considered an easy strain to grow, Dark Angel feminized cannabis seeds are completely devoid of any male chromosomes, ensuring that every seed you germinate will produce a strong, healthy female plant, with large, dense, resin covered buds. Perfect for all levels of experience, these seeds can be cultivated indoors or planting outside, given good conditions and will begin flowering as the light reduces to twelve hours per day or less. Flowering times are average for a cannabis hybrid, requiring approximately eight weeks for the plants to fully ripen and mature. Outdoor yields average 350 grams of dried cannabis buds per plant, while indoor growers, using techniques such as topping, bending and super-cropping can produce approximately 550 grams per square meter of the highest quality buds. As you would expect from the combination of two, highly prized medical cannabis strains, Dark Angel seeds produce buds rich in both THC and CBD, containing approximately 20% and 0.4 of each respectively. Enjoy a rich, uniquely flavored smoke that quickly relaxes the mind and body. Dark Angel feminized cannabis seeds are available in a variety of packet sizes, 5, 10 and 25 with huge savings on larger sized orders. 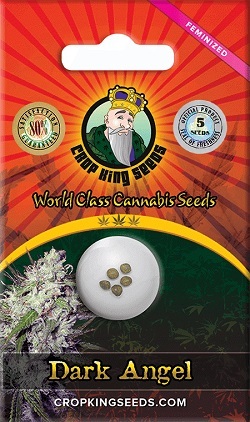 Enjoy the peace of mind that comes when ordering from the leading Canadian cannabis seed producer and supplier when you buy cannabis seeds in Canada from Crop King. To learn more and buy Dark Angel seeds, click below. Buy Dark Angel Feminized Seeds today and receive fast discreet shipping to Canada and all US states.